PinkyPiggu: MooJaa ~ Singapore's No.1 Mookata Thai BBQ Steamboat! 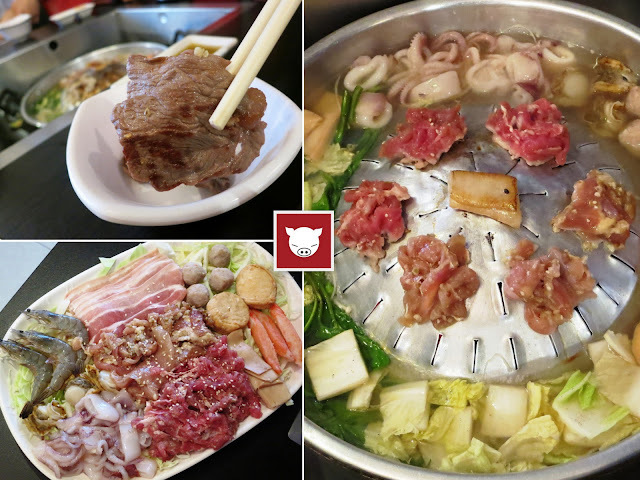 MooJaa ~ Singapore's No.1 Mookata Thai BBQ Steamboat! We love our BBQ, we love our steamboat! Mookata, a Thai-style BBQ steamboat, married our two loves and captured our hearts. What fired up a regular simmering pot of soupy goodness is the touch of sizzling smokey fragrance most irresistible and tummy gratifying, an experience which we thoroughly enjoyed at MooJaa, a Mookata restaurant situated along Keong Saik Road. "Mookata" literally means "Pork Skillet" in Thai and refers to the special cooking apparatus created to enjoy both barbeque and hot pot at the same time. The restaurant is bare in decorations, but bold in colors. Walls are unusually painted in black, while splashes of red are seen in the cushioned chairs, completed with more black for tables. I did not expect to see chandeliers in a casual steamboat restaurant, but it's really up there hanging off the ceiling. Noticed that the charcoal used for heating the steamboat is white in color? This is what sets MooJaa apart from the many other mookata outlets which has been popping up all over our island. The superior quality of the white Binchotan Japanese Charcoal ensures that we do not get black soot into the food and turning it acidic, which is commonly the case if locally obtained generic black charcoal is used. I appreciate that MooJaa has prioritized the diners' interest over what I believe would be higher operation costs. Another thing I like about using charcoal for steamboat is that the heat is consistently high. There is no need to constantly adjust the temperature of the pot to prevent it from over-boiling or staying stagnant, something which I always have to do when having steamboat at places using gas stove or induction cooker. 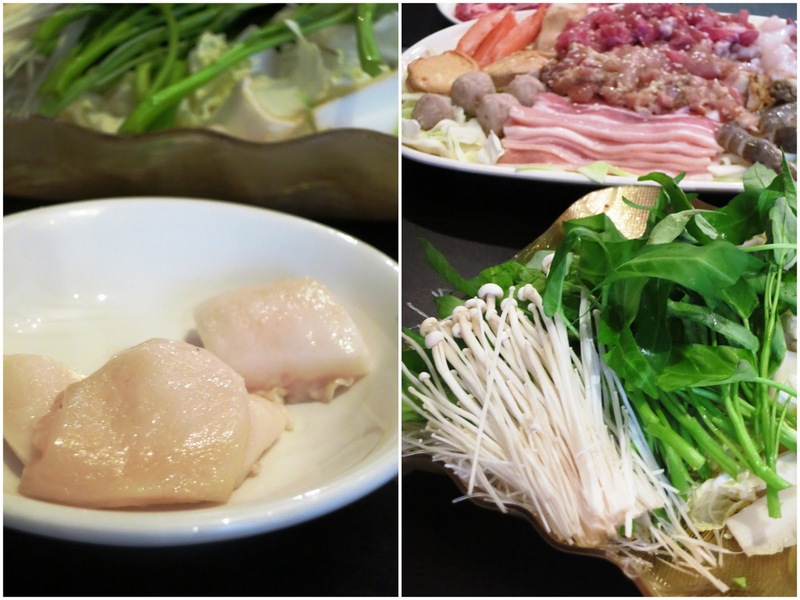 The tray of ingredients for our mookata meal was soon brought to the table and it all looked so fresh! Little wonder, because the Thai chef, who left her family's restaurant business in Bangkok to start up in Singapore, actually makes the effort to personally handpick the seafood and meat every morning. She then marinates it herself in a secret marinade, keeping it MSG free. These are quality ingredients too! Expect Hokkaido Scallops, Surimi Crab Sticks, US Angus Beef, Kurobuta Pork Collar! A couple of mookaka sets are available for us to choose from, decision is simply dependent on how much we can eat lol. Free flow of all ala carte items, choice of one plate of Kurobuta Pork or US Angus Beef per diner. Do you recognize that cube of white thing (above left of the picture)? Clue: When heated, it will melt into unctuous fatty goodness, adding a great fragrance to the barbequed meats. Answer: PORK LARD!! Lol yes, this is like the ultimate enhancer to make everything tastier. We let the pork lard sizzled to a crisp before greasing the oozed-out oil all over the dome-shaped grill. Meat is then placed on top, letting the smoke from the charcoal to waft up to the grill, perfuming the meat with a great smokey aroma. The resultant meats are perfectly browned and extremely delectable. I'm happy that it doesn't get burnt nor stick to the pan easily too, upping the enjoyment factor by much and wasting the food by none. My personal favorites are the succulent Kurobuta pork collar and pork belly, which simply melted me with their fats. I wish my fats will be miraculously melted away too. The dipping sauces which are prepared from scratch with 30 different ingredients are definitely worth a mention too. I keep alternating between the Spicy BBQ and tangy Sweet Sour Seafood sauce because I can't decide which one I like better. Both are equally good in their own ways and did a great job of complementing the taste of the meats. We also dipped the Fish Skin ($6) into the sauces, it's so crispy and addictive! I strongly recommend you to order the Cheese Balls ($8) which are not included in the set, but available as ala-carte items. Served steaming hot to the table, they can be eaten right away. 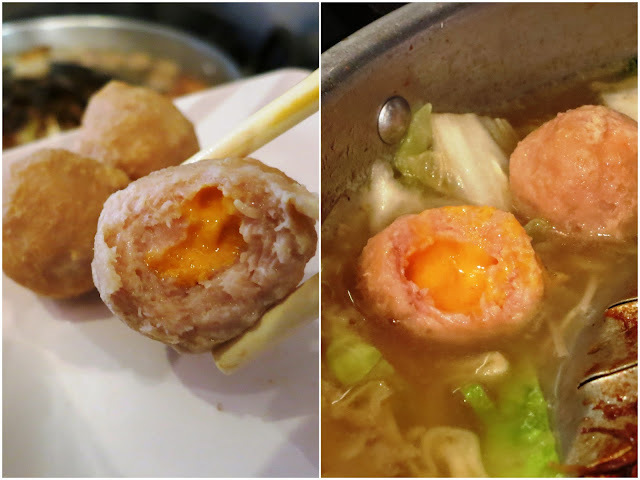 Its molten cheese will oozed out at each virgin bite into the ball, but do be gentle at it or risk the cheese spurting onto your arms, face, table, everywhere (clumsy me kena a few times -_-;). 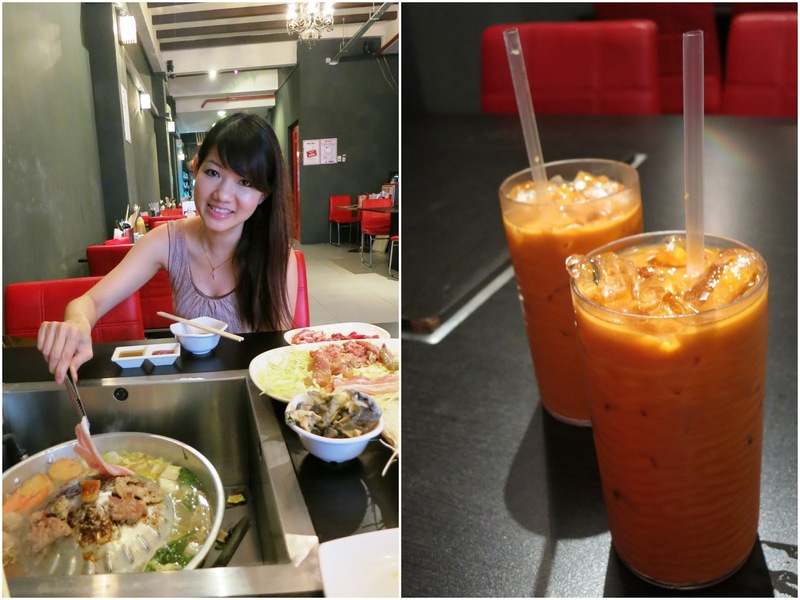 Our meal was accompanied by glasses of house-brewed Thai Iced Milk Tea ($2.50). Though we ate for a duration of 2 hours, I was surprised that I (who has a low tolerance for heat) did not feel hot and sweaty at all, none of the discomfort which I've always associated BBQ and steamboat with. The air-conditioning was strong and ventilation was good, this PinkyPiggu did not smell like barbequed pork after that lol. My friend, whom I bumped into after I left the place, can attest to it. He literally 'smelled' us hahaha! True story yo. Thanks to Shaun and the MooJaa team for the delicious mookata experience. Wow, you can eat so much yet be slim. What is your secret? Pork Knuckle Porridge ~ Recipe Included!